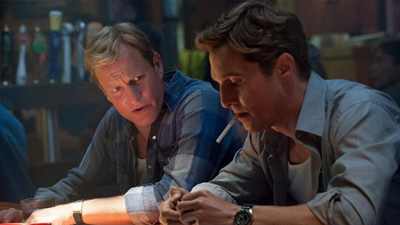 True Detective • S01E04 : Who Goes There? Hart and Cohle hunt for their newly identified suspect, Reggie Ledoux, a meth cooker who shared a cell with Dora Lange's husband and recently skipped parole. As Hart's personal life collapses around him, Cohle immerses himself in an old criminal identity from his narco days, contacting an East-Texas biker gang known to deal with their primary suspect. Cohle's undercover work takes him to a dangerous edge where the law has no place, and both men must confront the cost of living a false life.